Are we doing DevOps or SRE? There are many blogs, videos, and Quora posts discussing the similarities and differences in both the practices. SRE was developed by Google for internal consumption and overlaps with the DevOps culture and philosophy. Now let’s see a definition of DevOps and SRE! DevOps is more of an organizational culture that fills the gap between coder and the operation person and aligns them to the overall organizational goal. SRE is what happens when a software engineer is entrusted with operations! This audiobook explains both of them in length and also covers relevant case studies and success stories and implementation strategies. 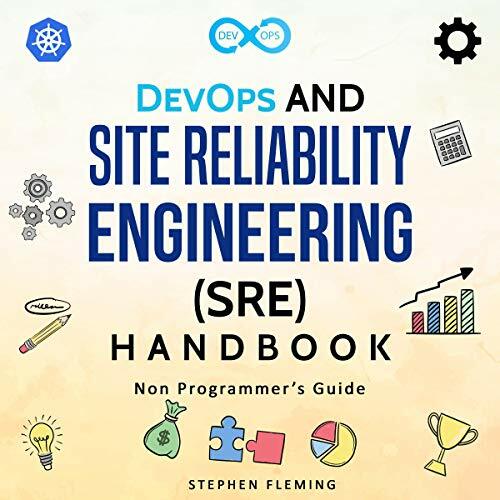 This audiobook can be used by a beginner, technology consultant, business consultant, project manager, or any member of the project team trying to figure out SRE and DevOps. The structure of the audiobook is such that it answers the most asked questions about DevOps and SRE. It also covers the best and the latest case studies with benefits. Therefore, it is expected that after going through this audiobook, you can discuss the topic with any stakeholder and take your agenda ahead as per your role. Here is your chance to dive into the DevOps and SRE role and know what it takes to implement best practices. The DevOps, continuous delivery, and SRE movements are here to stay and grow; it's time you to ride the wave! So, don’t wait; take action! Excellent background book for beginners and intermediates. If you work in DevOps and you haven't listen this book....DO IT SOON! I wanted to turn this off - the narration is the worst. The narrator couldnt pronounce words correctly and also misplaced syllable emphasis - it was very distracting and made this a rough listen. Also, the content is very, very basic - especially from the DevOps/Agile side. Basically, if you have never heard of these terms, you could benefit; otherwise, pass. I can’t speak much to the content as I couldn’t get past the first 30 minutes. In this time most of the content was a list of things that “will be covered more in a future chapter”. Almost like listening to someone read the table of contents or index. Like I said in the subject I learned enough to be interested in reading the written form, but I can’t bring myself to slog through the list reading. Many disconnected, unsupported statements. I am not sure if the language issue are odd choices by the author or mistakes by the narrator. I have over 30 years in the industry. I hoped to get some kind of insight through this book but there was nothing of substance. This book is awesome - it's very thorough and dense but still easy to understand. It's also applicable to the real world, you can tell it's well researched and written by experienced people. This book is great for IT and business leadership,but also for engineers and operations analysts as they work to integrate and optimize their product value streams. This book provides not only information on what DevOps is, and how to implement it, but also the history and circumstances which led to and justify this revolution. If you only listen one book about DevOps it should be this one.This is great non-programmers guide. DevOps is a term used in enterprise software development that refers to a kind of agile relationship between information technologies (IT) operations and development.